by John Flowers, Karen Vannoy. Abingdon Press, 2014. 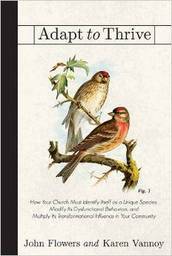 We often think of the church as an organization, but in this book, authors John Flowers and Karen Vannoy, push readers to think about the church as an organism. Organisms, by their very nature, learn to survive through adaptation. And that is what Flowers and Vannoy believe to be the key to churches not only surviving, but transforming and thriving. Through presenting ten adaptive principles and numerous case studies, this book will help congregational leaders modify dysfunctional behaviors and discover the attitudes and perspectives necessary to transform their communities. Clergy and lay leaders who read Adapt to Thrive will be equipped to discover their own unique identity as a church and make the changes necessary in order to flourish. Both Karen Vannoy and John Flowers have served for many years as United Methodist pastors and in new church development, speaking to and mentoring pastors and their congregations.